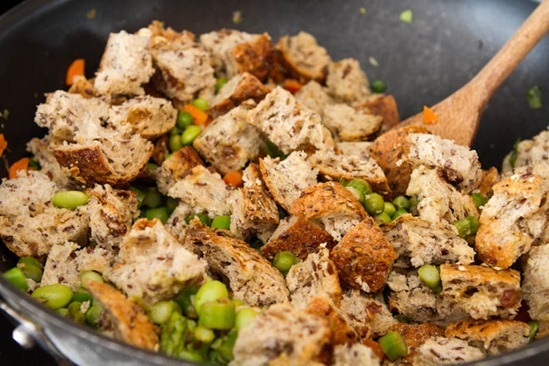 A couple weeks ago, a reader named Cara emailed me with a recipe request for a vegan spring stuffing. Her complaint with traditional stuffing was that it felt too much like autumn instead of spring; it tends to be heavy, instead of light and fresh. Cara is onto something here, don’t you think? I love when I get recipe requests because I feel like I have a mission instead of just aimlessly trying to think up recipe ideas all the time. It’s also fun to be presented with a “problem” and then hopefully making someone happy with the end result. 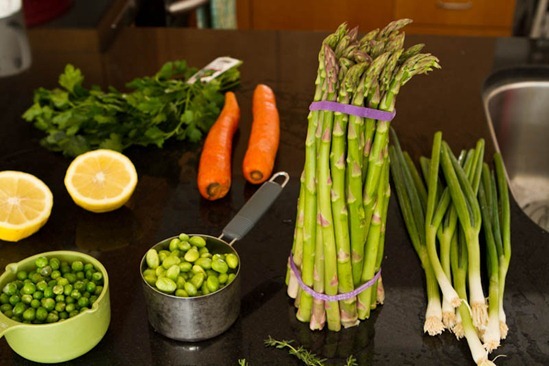 I got to work rounding up some of my favourite green spring-time vegetables like asparagus, green onions, and peas. I also picked up some fresh parsley and thyme for flavour. This is turning out to be one green spring stuffing! I also recommend using a hearty seed & raisin/cranberry bread (from your grocer’s bakery is fine!). 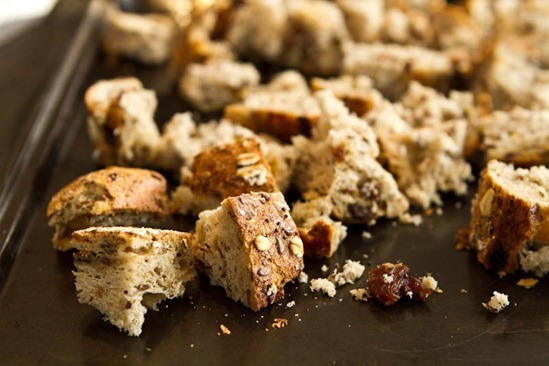 The raisins and cranberries in the bread will add just a hint of sweetness, but it won’t overwhelm the stuffing. The seeds will also add texture and the thick crust will prevent the entire thing from turning to mush. I have no idea how this stuffing would turn out with another type of bread. The next day we can officially begin. 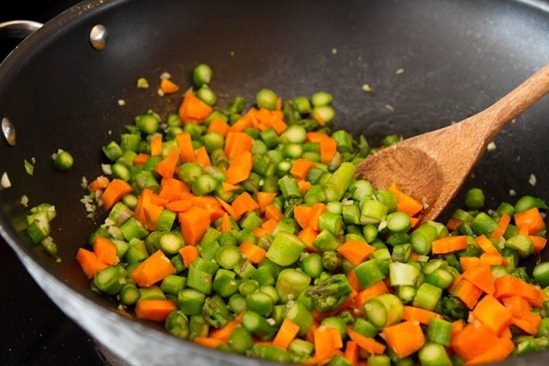 Sauté the olive oil, minced garlic, carrots, and asparagus until they are just tender. Be sure not to overcook it as you want the veggies to retain some crispness in the stuffing. Now add in the peas and edamame and cook until heated through. 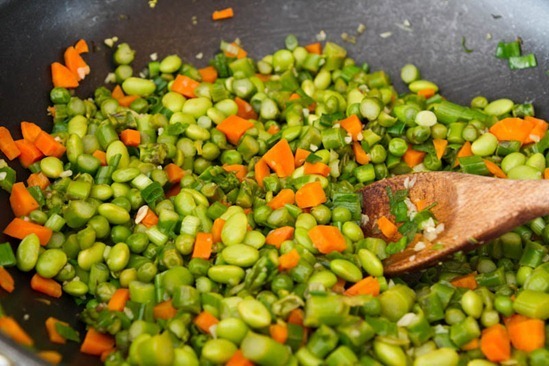 Next, is the part that you do not want to skip – season the vegetables very well! I used a generous amount of Herbamare and ground black pepper. The Herbamare was fantastic in this, so if you can pick some up, I highly recommend it. Remove from heat and stir in the bread. followed by the fresh and dried herbs. Finally, gently stir in 1 cup of vegetable broth. Many stuffing recipes tend to call for 2 cups or more of broth, but I didn’t want this one too heavy and saturated so I just used one cup. Transfer it to a greased casserole dish, cover, and bake for 27-30 minutes at 400F. 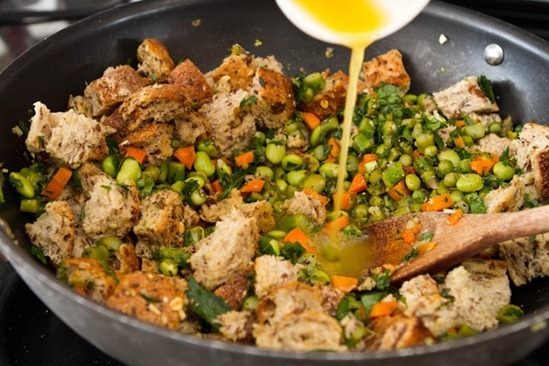 What you’ll have is an incredibly light stuffing bursting with spring vegetables. The bread pieces on top remain a bit crusty, while the bread underneath gets really soft, saturated, and doughy. Traditional stuffing usually gets a bad reputation for being one of the unhealthiest dishes at your dinner table. Well, now it doesn’t have to be any longer. It’s actually so healthy, it makes a killer breakfast. I actually made this at 8:30am last week and inhaled a plate for breakfast…just throwing that out there! 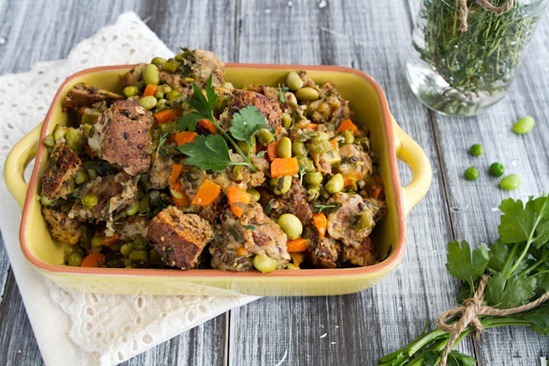 A lightened up stuffing that you can feel good about this spring. Many stuffing recipes tend to call for 2 cups or more broth, but I didn’t want this one too heavy and saturated so I just used one cup. Also, feel free to use frozen peas and edamame like I did. Just be sure to thaw overnight in the fridge and rinse and drain prior to use. I also suggest using a crusty seed & fruit bread from your local grocery or bakery. This type of bread will hold up much better in the recipe, as well as provide a light sweet flavour from the cranberries and raisins. 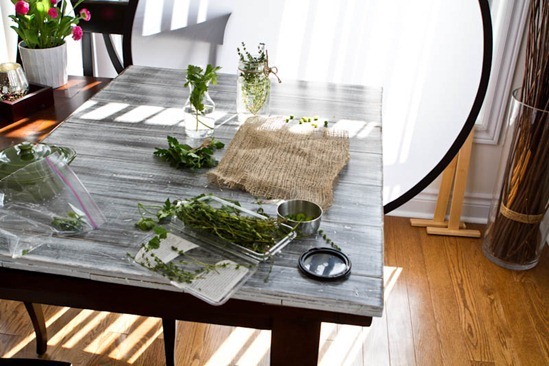 Here’s little behind the scenes action for you, using my homemade photography board, diffuser, and props (herbs, burlap, and napkins). I’m also still loving Helene’s book. I highly recommend Plate to Pixel if you are getting serious about food photography. 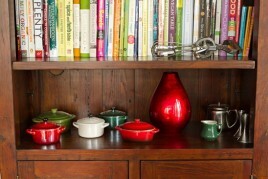 I’m trying to practice a ton in hopes that I will feel comfortable shooting all of my cookbook photography. If you are looking for a main dish to serve the stuffing with, I suggest trying the amazing Lentil Walnut Loaf. I’ve also updated my featured recipes in recipage to reflect some of my fav holiday dinner side dishes like balsamic green beans and high protein mashed potatoes. Coming up, a mini & portable chocolate peanut butter dessert that will blow ya mind. Gasp…you mean I can eat stuffing in the spring!?!? Seriously, why are there foods that we feel like we can only eat seasonally? I’m a stuffing FREAK and now I’m going to make this and enjoy every bite…even if it feels a little naughty. Even better! I love this recipe! 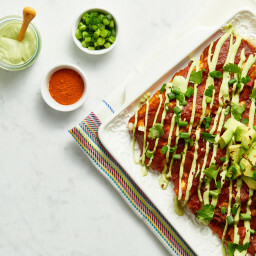 My roommate and I were just looking the other day for delicious recipes to go along with our vegan Easter feast and I’ve got a hunch that this one will make the list. Not shocking, but the rest of the dinner menu is filled with your recipes, too!! That is so nice to hear. Enjoy your meal! Oh my goodness, yum! Thank you for sharing this Angela! Find a good vegan stuffing is such a challenge. This looks delicious! One thing I love about living in Holland are the many different bakeries and variations of bread.. the Dutch looove their carbs! I will definitely try this lightened up version. Thank you! I’ve never thought about the fact that traditional stuffing is “fallish” – but it’s true! This recipe looks awesome! Makes me want Easter to be RIGHT NOW. Beautiful recipe and photos, as always, Angela. I’m in awe of all that natural light – so jealous! 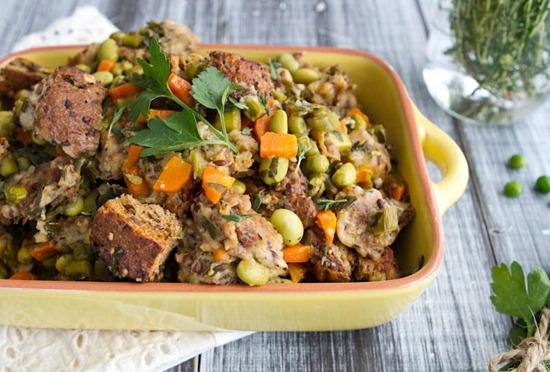 I had never even considered stuffing in spring (because it is so heavy) but this looks like such a lovely recipe. And I love the use of hearty bread, here… what a great idea! I never thought about a spring stuffing but that’s a cool idea! I’d have to have some cranberry relish to go with it though. Gotta have my cranberries. This looks AWESOME Angela!! I love this idea actually…I never think of stuffing for anything other than Thanksgiving but it would be such a great side dish year round! Wow Ange, I’ve never had stuffing at Easter but this sounds fantastic! And like you said, I could probably even eat it for brekkie! My kitchen has been booming with asparagus creations lately… must be this spring sunshine hey? So glad the weather seems to finally be turning around. Your photos look so so lovely in these shots. I’ve heard of Plate to Pixel, and it’s definitely on my list of ones to read. Right now, I’m working on getting through Food Photography: From Snapshots to Great Shots which I ordered a while ago but haven’t had time to delve into. I’m actually really looking forward to playing with my camera this weekend… might need an expert lesson from you soon! ;) Have a fab day! This looks wonderful, Angela, and when I saw the pics, the first thing I thought was THAT is Helene’s look! Beautiful job on the photos and congrats on shooting your whole book, on your own. Not only writing and developing the recipes, but also photographing them, jack of all trades. Wow..CONGRATS! Yum looks so good! Perfect for spring! Wow, this looks incredible! I LOVE stuffing, but have never thought about it outside of fall/winter holidays. 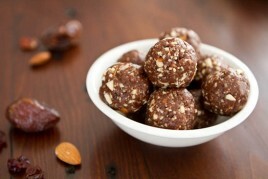 Definitely going to pick up some of the ingredients I don’t have on hand and make this soon! 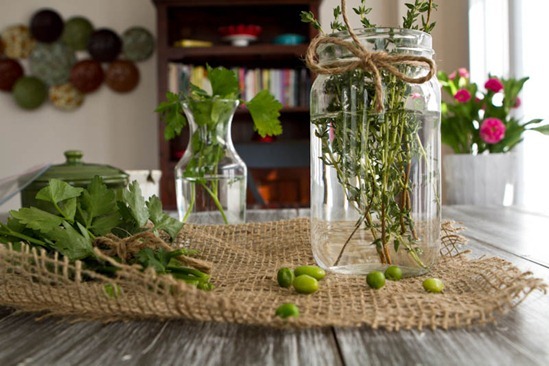 The second picture with the herbs and burlap is gorgeous by the way! love this idea! and i like how you keep the bread chunks big as opposed to chopping them up small, which is usually typical. Love all the greens and herbs, they really make for gorgeous photos. Love the behind the scenes camera work because honestly, even though I want to get into photography more, it’s hard for me to sometimes understand – and a visual reeeeally helps. I’m hoping once I’m done this semester, I’ll actually be able to read books for ENJOYMENT (vs. to learn – even though I guess getting a photography book is technically learning, too haha). I can’t wait for April 20th to come and go because it signals freedom! well, that’s a typo for sure. Thanks, it’s fixed. Beautiful stuffing! I will make this to bring to my in-laws Easter dinner. Vegan and healthy. I love this recipe! We have a huge feast after Easter, and while it’s generally meat dominated, I have a feeling this will please everyone there — and give me something delicious to eat! Looks absolutely delicious! I loooove stuffing… so this is perfect and will make me feel way less guilty for eating it :) Thanks Angela! And your photography looks absolutely amazing! Yum yum, get in my mouth!!! I think your photos have a very distinct look and it just wouldn’t be your cookbook if you weren’t also the photographer. I can’t wait to see the result! Thank you, you are too kind! I’m practicing a lot lately, trying to improve technique. It’s really fun though and I love it the more I practice. I’ve only made stuffing once, and it was the easy boxed variety. I’d really like to make a more grown-up version. the potted rosemary went to a neighbour I think! Although I do hope to plant some of my own this spring. This looks great! I’d imagine you could adapt it to just about any veg combo you prefer as well, making it a good way to “use up” whatever’s hanging in the fridge waiting to be forgotten about… I’m going to have to play with the bread though, as my husband can’t do whole cranberries/oats/some seeds (crohn’s) Thanks! Your photos look gorgeous – I have no doubt that you would do an amazing job shooting your own photography for your cookbook! I absolutely love the distressed wood board. PS I made your lentil walnut loaf last weekend and am a big fan!! And she does it again… looks amazing, Ange!!! Fruit was on my mind too…although I was too chicken to try it out. Maybe next time! Enjoy if you make it. Mmmmm this looks absolutely delicious! I love the addition of the edamame too – this has enough protein to be a main dish served by itself ( major bonus in my book!!). Do you think adding mushrooms would ruin the spring vibe to the dish? Im sure it would taste delicious…I also debated putting mushrooms in but didnt want the ingredients to get too much longer. Enjoy! This recipe sounds amazing and I admit I don’t think of stuffing outside of big holiday meals because it is so ‘heavy’. I’ll have to give this recipe a try! Before you even mentioned the cookbook photography, I was thinking to myself that your food photography has really come a long way and is quite impressive. I love that you’re self-taught and that the food is real! Can’t wait for the book! Thank you Nicole, that is so nice of you to say! I appreciate it. Oh, Angela, it look sooo good! This looks so delicious! And I love your photos- there’s so much texture and color. Thank you! OH MY GOODNESS! This looks amazing! I was just thinking “hmmm what should I make for Easter that everyone will enjoy and I’ll actually eat!” You have answered my question for me! thank you! I’m curious, why no microwave?? After I read The Kind Diet I have been trying harder not to use mine and just wondered what made you not want one. I hope you enjoy the stuffing! Re: microwave- I’ve heard a lot of negative things about how it depletes nutrients in food so I figured it was time to try kickin it old school for a while. I hope to steam things on the stove top as much as I can. so far im not missing it as much as I thought and Im getting used to reheating things on the stovetop now. Yeah, I’ve heard that too :( My brother doesn’t have a microwave and I always gave him a bad time about it….Hmmmm karma? ha. What about a toaster oven? I’ve heard you can re-heat in those on the “broil” setting? Wonder if that depletes the nutrients? You’re right, that would make a wonderful breakfast. I may try to assemble this for a mother’s day brunch. Wow, I really thought you had an outdoor patio for those “outdoor picnic table shots.” Impressive! Eric will be delighted to hear that! I used to hate stuffing…until now! Oh my! Of course only you could change something that I didnt like, into something I need to make asap! Your photos today are amazing – especially the first three. I thought I was on ‘Tartlette’ for a minute which is my favourite photography blog. 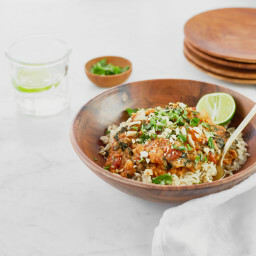 This looks so delicious and although it is lightened up, it is still hearty enough to satisfy pre-warm weather. Thanks for sharing your creative genius! oh and this mini/portable chocolate peanut butter dessert that will blow MY mind…BRING IT! heh I will, don’t you worry. Enjoy if you end up making it! Yum! This looks SO good. Thanks for the recipe! Nice to see you have your whole setup ready to rock in the new place! Some nice lighting too from the looks of it. I always say ‘had I known I was going to be taking pictures of a billion different recipes by a window, I would have picked a different house’ the lighting in here can be so terrible at times! This looks so, so good!! Have you ever prepared stuffed artichokes? They are definitely in season and we love them in this Italian household! You have to try them!! Hearty, festive, brown and filing are things I think of when I picture stuffing typically- but now perhaps bright, light, green and spring are going to be my new words! Why didn’t I think about it myself? Awesome idea! This is awesome! I’m definitely making this soon, but I have one question as I have zero experience in making any kind of stuffing. Will it still be good the next day or will it get all soggy? 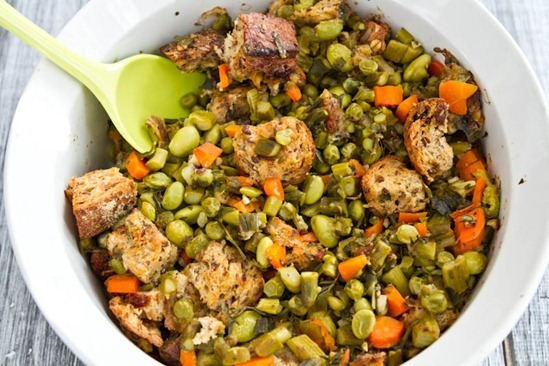 BTW, I’m not a native English speaker and it’s always been funny for me that this kind of dish is called stuffing or (even funnier ;)) dressing. For me stuffing is something you use to stuff something else (other than yourself ;)) and dressing is something I add to my salad ;) Newer mind the name though, this one is on my to-make list! Fabulous! 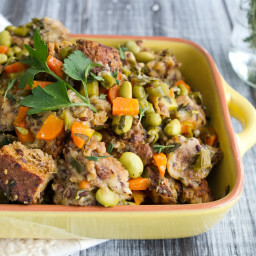 I love the idea of spring stuffing! It looks so good!!! Great way to get my bread fix while having healthy veggies!! I recently started reading your blog and I read it for hours. Thank you for introducing me to new recipes. On my blog site I nominated you for the Liebster Award. This looks amazing. I think the sweetness of the bread would be key… I wonder if I can find a suitable gluten-free replacement. How creative…nice to see something out of the ordinary pop up…you never think about stuffing in the spring..great idea! I’m so excited!! I’m FAMOUS! ;-) Looking forward to making this for Easter dinner with my family. Looks FESTIVE–just what I was looking for! So glad you saw this post!!! :) I hope you like it…it’s my first time making anything like this, so hopefully it doesn’t disappoint. Lovely! Good on you for ditchin’ the microwave, it is all around bad news. I always say- why wouldn’t you replace your microwave with a juicer?? It would do you a world of good. This recipe looks absolutely delish! Thanks for sharing! Found out about your blog through this recipe a few days ago. Did this one last night and everyone LOVED it, nothing left in the kiddos plates. Straight in the “Recipe to keep” binder. wow, kids love it too? Amazing! oh yeah, my kids love food, all the food: From French (I am French, hubby is British) to chinese, japanese, mexican, indian… spicy or not, vegetables… deserts.. They loved your green monster smoothie the other day, I had not told them what was in it, they had to guess, but drank the lot in 2 min flat! Everything is homemade in our house, next step is to teach them how to cook, which they want to learn too. The one problem: my older son (he’s 16) won’t touch raw veggies, so no salads, which is very annoying especially in the summer! Made this today for a lunch potluck. I baked it this morning and it was still warm enough to eat at lunch, and it was a huge hit! I’m a grad student, so I had to take it with me to my morning class and torture myself and others with the amazing smell for 2 hours! I will definitely be making this again. Thanks! What a great idea!! 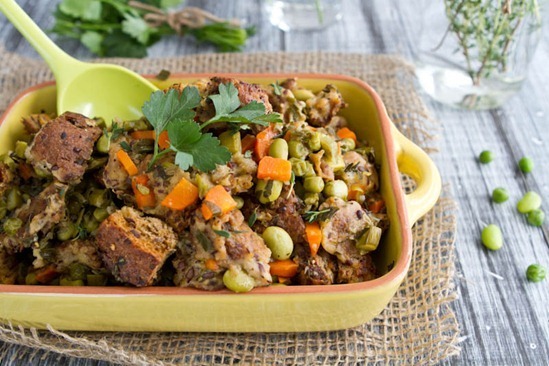 I’ve never tried to make stuffing since going gluten free…but I may just have to try this! Do you think it could hold up with a gluten free brand of bread? I’m not sure Hannah, I haven’t really worked with any GF bread before so I’m not sure how it behaves. I would probably try looking online to see if anyone has done it already and it might give you a few ideas as to how it would behave. This was my first time making stuffing. It was delicious! The next time, I think I’ll put some more veggies and less bread. The veggies were so flavorful on their own (even with dried parsley instead of fresh.) I used a white baguette. Wow, this looks absolutely incredible. 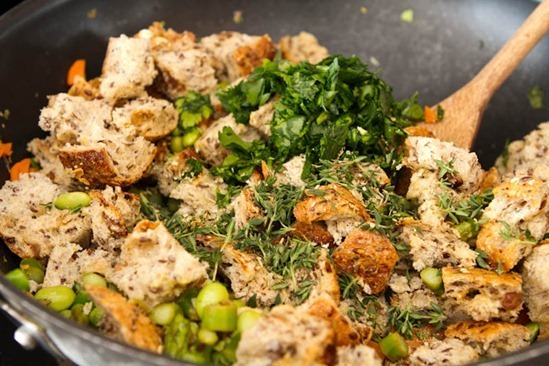 Stuffing is my absolute favorite Thanksgiving food… it never occured to me to enjoy it all year round. Definitely adding to my must-make list! I’ve been looking for a recipe that I can finally try out asparagus with, and this might be it. You even added edamame to the dish. I’ll definitely bookmark this and try it out for this weekend. Asparagus in stuffing! What a fantastic idea! 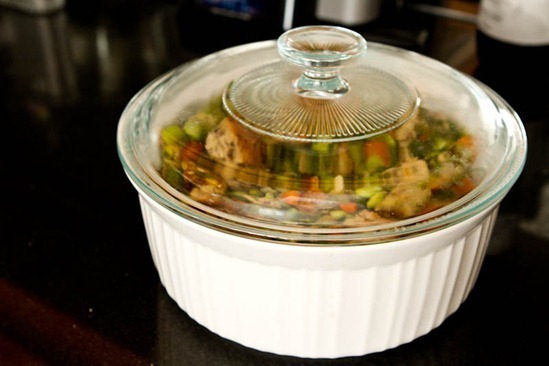 What is the best way to store leftovers? And could you make a day in advance? Looking forward to trying this one out on Thanksgiving! 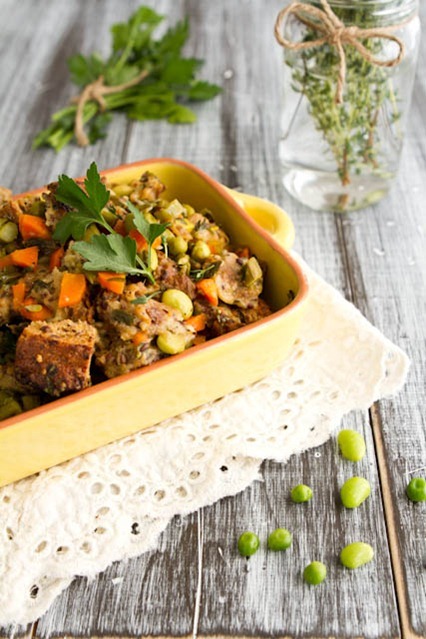 I made this stuffing for Easter and it was a hit with both the meat-eaters and vegetarians! Thanks for the idea and I’m looking forward to the cookbook coming becoming available. I enjoyed this recipe, however I think there might be different sizes of loafs. Mine had way too much bread and when making it again I would probably use half of amount of bread next time. Thank you for sharing these wonderful recipes! Made this tonight using raisin/cranberry/pecan loaf. Didnt have time to dry out cubed bread, so toasted it briefly in the oven once it was cubed and let it dry out for a few hours afterwards. One word- Amazzzzzzzzzing! So delicious, came together perfectly. In the midst of the last of our winter weeks, spring was popping in my mouth. This will be a go-to for certain! 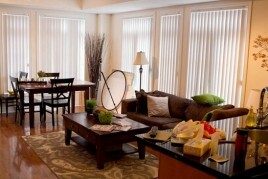 This is totally unrelated, but I just love your table in these photos!! Thank you! 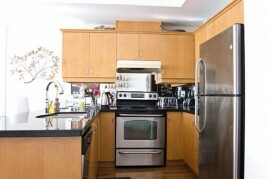 We purchased it from a local furniture store in Burlington, Ontario. At what step do you add the bread? is it step 4? Do you have a Thanksgiving stuffing with granny smith apples and stuffing? I swore I printed it off your site last year, but now I can’t find it. This looks delicious! I’m making it for an early Easter potluck. But just a quick note: your description at the top of the recipe says “soy-free,” but the recipe calls for edamame, which are, of course, soybeans. 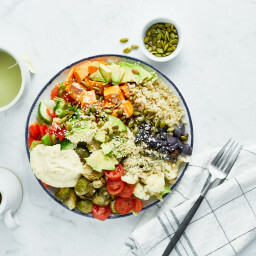 You might consider either taking “soy-free” off the description, or indicating in the ingredient list something like, “optional – leave out if making soy-free” with the edamame listing to be more accurate – especially in case the soy-free part is a health/allergy necessity. I made this for Easter for my family that loves everything that requires a stick of butter in the recipe and it was a huge hit! I didn’t have asparagus so substituted celery, yet it was still great. I bought Herbamare just for it, and that will definitely find its way into my other recipes. It was so delicious (and I look forward to finishing off the small amount of leftovers for breakfast). Great recipe! Hey Sue, Oh yes this is an older recipe! I remember really loving it at the time, but it’s been a while since I made it. I will put this on my list of recipes to revisit this spring. :) I remember the crusty seed & cranberry raisin loaf adding so much to this recipe, so I would suggest using a great fresh loaf as the base. The pops of cranberry and raisin were really nice (if you’re into that). Just saw this pop up in the most recent Oh She Glows newsletter and wanted to add — I made this for my large family Easter get-together back in 2012 when this recipe was first posted and it has been DEMANDED every year since! I always use a cranberry pecan bread from a local bakery and it’s absolutely delicious! While this recipe is absolutely fantastic as is, I look forward to seeing a reboot! Hey Brooklyn, Awww I’m SO Happy you left this comment…thank you!! It’s hard for me to remember sometimes when I haven’t made a recipe in a while. That’s so fun that you’re family demands it! Haha. How can you argue with that? ;) I’m really looking forward to testing it again soon. Hey Sue, I’m so happy it was a hit! I plan on making this soon and adding it to the app. I love that you tried it with the cranberry raisin bread too. It’s such a treat!